Abstract. Nitrogen applied to the surface of the land for agricultural purposes represents a significant source of reactive nitrogen (Nr) that can be emitted as a gaseous Nr species, be denitrified to atmospheric nitrogen (N2), run off during rain events or form plant-useable nitrogen in the soil. To investigate the magnitude, temporal variability and spatial heterogeneity of nitrogen pathways on a global scale from sources of animal manure and synthetic fertilizer, we developed a mechanistic parameterization of these pathways within a global terrestrial land model, the Community Land Model (CLM). In this first model version the parameterization emphasizes an explicit climate-dependent approach while using highly simplified representations of agricultural practices, including manure management and fertilizer application. The climate-dependent approach explicitly simulates the relationship between meteorological variables and biogeochemical processes to calculate the volatilization of ammonia (NH3), nitrification and runoff of Nr following manure or synthetic fertilizer application. For the year 2000, approximately 125TgNyr−1 is applied as manure and 62TgNyr−1 is applied as synthetic fertilizer. We estimate the resulting global NH3 emissions are 21TgNyr−1 from manure (17% of manure production) and 12TgNyr−1 from fertilizer (19% of fertilizer application); reactive nitrogen runoff during rain events is calculated as 11TgNyr−1 from manure and 5TgNyr−1 from fertilizer. 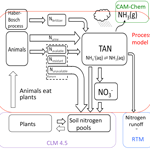 The remaining nitrogen from manure (93TgNyr−1) and synthetic fertilizer (45TgNyr−1) is captured by the canopy or transferred to the soil nitrogen pools. The parameterization was implemented in the CLM from 1850 to 2000 using a transient simulation which predicted that, even though absolute values of all nitrogen pathways are increasing with increased manure and synthetic fertilizer application, partitioning of nitrogen to NH3 emissions from manure is increasing on a percentage basis, from 14% of nitrogen applied in 1850 (3TgNH3yr−1) to 17% of nitrogen applied in 2000 (21TgNH3yr−1). Under current manure and synthetic fertilizer application rates we find a global sensitivity of an additional 1TgNH3 (approximately 3% of manure and fertilizer) emitted per year per °C of warming. While the model confirms earlier estimates of nitrogen fluxes made in a range of studies, its key purpose is to provide a theoretical framework that can be employed within a biogeochemical model, that can explicitly respond to climate and that can evolve and improve with further observation. How to cite: Riddick, S., Ward, D., Hess, P., Mahowald, N., Massad, R., and Holland, E.: Estimate of changes in agricultural terrestrial nitrogen pathways and ammonia emissions from 1850 to present in the Community Earth System Model, Biogeosciences, 13, 3397-3426, https://doi.org/10.5194/bg-13-3397-2016, 2016. Future increases are predicted in the amount of nitrogen produced as manure or used as synthetic fertilizer in agriculture. However, the impact of climate on the subsequent fate of this nitrogen has not been evaluated. 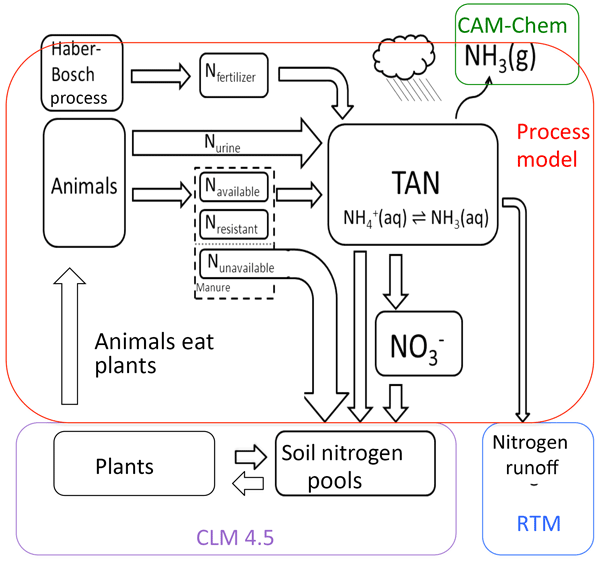 Here we describe, analyze and evaluate the FAN (flows of agricultural nitrogen) process model that simulates the the climate-dependent flows of nitrogen from agriculture. The FAN model is suitable for use within a global terrestrial climate model.